"The Magus" has been selected to screen at the Antimatter Film Festival, which runs October 14 - 22, 2011. It will screen as part of the "How to Explain It to My Parents" program on Wednesday, October 19, 2011 @ 9:00pm at Open Space. The Festival is currently in it's 14th year. Also screening in the program: Deus Ex Boltanski (Robert Gardner | USA), Four Cubic Feet of Space (Tony Gault | USA), How to Explain It to My Parents: Arno Coenen (Lernert & Sander | Netherlands), My Film Festival Entry (Neil Needleman | USA), Albumleaf (Paul Turano | USA), Tony Conrad: DreaMinimalist (Marie Losier | USA). 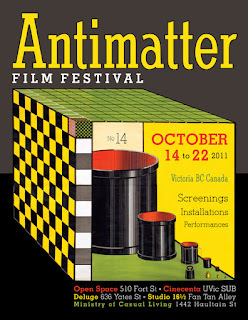 Since 1998, the quality and creativity of its programming, commitment to audience development, and respect for filmmakers and their work have made Antimatter one of the most important media arts events in Canada, and the world.